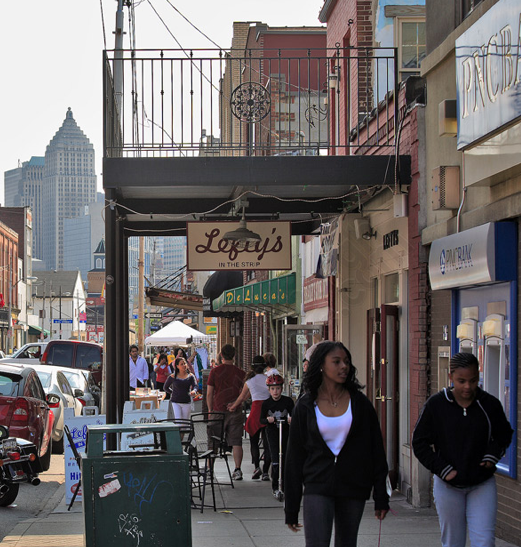 Debating Points: It's Peduto's time, and sad to say it's not Wagner's. Toughness and savvy under pressure. Community involvement. Sound transportation priorities. Efficiency and collaboration. Independence. From recent WTAE television and KDKA radio mayoral debates, five exchanges stand out confirming everything we've begun to demonstrate about what to expect under four more years of Wagnerstahl-style machine governance, and how the future with a newer, broader coalition is a lot brighter and open to possibilities. Bear with me because the full debates aren't online (yet), but if anyone disputes my account let's have at it. 1. Jack Wagner, when required to compliment Bill Peduto, allowed that the latter is "very creative" and that he liked "the financial piece." I am not sure to what "financial piece" Wagner is referring, but if it was the "midnight" pension solution to the state takeover threat of 2010, that was a generous compliment indeed. Talk about a Mayor being stubborn, sweating out Councilors with deadline pressure, and being unwilling to participate or communicate. Talk about other Council members covering for the Mayor, and assailing Bill Peduto for all manner of supposed treasons. Talk about working with his colleagues and being a part of bringing all his fellow Councilors together in the end. Talk about the ability to negotiate with the state through the crucial last minute and beyond, as Finance Chair. And talk about protecting public assets, keeping taxes down and employees on the job delivering services. Meanwhile, Burgess, Lavelle and Smith -- Wagner and Ravenstahl allies, all -- were urging us to cave in to the mayor's parking privatization strategy, likely to have burdened us with problems. The entire episode encapsulates Peduto's own argument for himself. 2. Bill Peduto spoke out about community benefits agreements, and Jack Wagner said, "That's exactly what we did with the TIF at PNC." I don't mean to denigrate the use of tax increment financing for PNC and what PNC Bank has done and is doing in general. But that's not a new hockey arena, or a casino, or an amphitheater and hotel, or a shopping center and a hotel, and it's hardly a matter of neighborhoods Downtown. The mere idea of the conversations Pittsburgh has been having about reforming and improving development policy seems like something Wagner might need to catch up on. He doesn't need to love community benefits agreements like the progressive left, but he will need to have the vocabulary and a respect for the concept. 3. Jack Wagner said that traffic and delays at the Squirrel Hill tunnel is "something that's holding back the region," and that he would like to pursue avenues to "do something about that." Hmm. Lots of transportation needs. I hate rush-hour traffic as well, and when combined with a tunnel, throw in some construction... buddy, you might as well be driving in a major city. 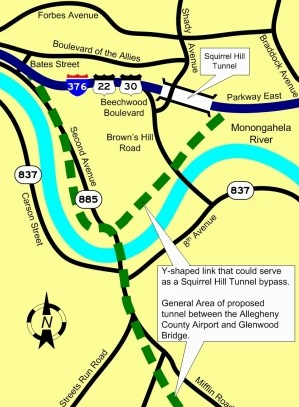 What might Mr. Wagner have in mind to solve Squirrel Hill tunnel crisis holding back the region? Might it be the Mon-Fayette Expressway? Read all about it. Interestingly it provides a link to James Dodaro, not to mention by inference the heavy building trades. Pittsburgh faces major decisions on how to spend its precious federal and state transportation money. 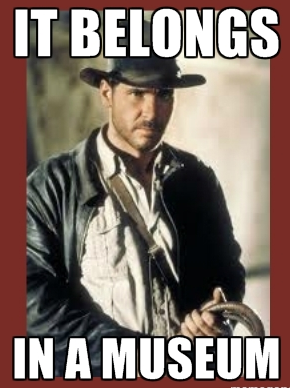 I feel about the MFX roughly the same way I feel on high-speed Maglev and the way Indiana Jones feels regarding a lot of ancient idols: "It belongs in a museum!" 4. Peduto wants to work with the County to consolidate the RAD parks and maybe even "merge" the parks system. Wagner came out totally against that, suggesting it's a giveaway to the County (and to Fitzgerald!) to let somebody else get their hands on (spending) those sweet, sweet RAD dollars. The idea that joint management over top of joint purchasing and joint service provisions could save us significantly, and even enhance service, hasn't seemed to register with Jack Wagner. Mine! Ours! Our money to play with! To each our own! 5. Wagner disagreed with Peduto on the need to conduct a national search for a new Police Chief, calling it specifically a "waste of time" and a "distraction." The idea of casting a very wide net for such an important position and looking for a special kind of person, who has succeeded in really tackling non-unique challenges relating to both professional management and community policing, sounds a lot more comforting. In these debates, Peduto is demonstrating that though alas, he may not be our savior -- he could micromanage the many policy initiatives he feels so passionately about, or he could occasionally feud with any Mayor's inevitable rivals, missing out on optimal collaboration -- he would be a lot more independent, collaborative, cutting-edge and grassroots-oriented than what Pittsburgh's been getting. And Wagner might as well be wearing a sash that reads, "What we've been getting." A link to last night's live televised WTAE debate is here. The Post-Gazette endorses Natalia Rudiak for being "a smart and effective hard worker", "not afraid to confront the status quo". Go figure. Wasted time, Missed opportunities, Failed strategies: the "Old Guard" needs a break. Let's talk paving streets, for example. Laying down asphalt is difficult enough to begin with, since the City has only been able to afford about a third as much capital resources as are necessary to keep up with pavement deterioration, until finally we caved in and borrowed money just to get one third closer. Choosing streets wisely is pretty important -- so thus, too, is keeping political pressure at bay. Some neighborhoods and some people speak louder than others. Politically. 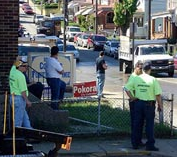 Once upon a time, thanks in part to Councilman Bill Peduto's leadership, the City purchased a computerized pavement management system. The sort of thing to assess street conditions using transparent objective criteria, and point to reasonably optimal advice on paving schedules. Other cities use it. Mayor Luke Ravenstahl opted against using it, preferring instead the old, less traceable "eyeballing" method of evaluation combined with the gut instinct and experience of Public Works managers. In the run up to the 2007 accountability moment, Peduto briefly shamed Ravenstahl into adopting the computerized system again. One might surmise it was popular. But then the Mayor got rid of it again after the election. 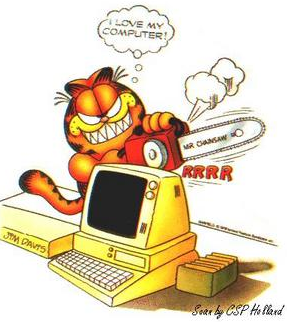 The reason the Administration gave was interesting: that we can afford pave so little, we can't keep up with the computer's demands. [The Comet] never understood the argument that since we have less money for paving than we used to, we must scrap the computer system, or it will keep demanding that we repave too much. Can't we, uh, just punch in a new number? The Mayor was making a thin excuse. He just didn't want to use the computer. So Pitsburgh has not used a computerized system for six years, and your roads are about how you think they are. In the story, Gilman commended Kaczorowski “for taking quick action.” But, he said, there’s a problem if it takes a reporter or city council office to get the problem fixed. “The bottom line is it’s dangerous to the public,” Gilman said. At 7:13 a.m., 8:54 a.m. and 9:02 a.m. Tuesday, Gilman received emails from Kaczorowski. In the second email, Kaczorowski ruled out the possibility of paving Kittanning this year. “Not able to add to this year’s list,” he said, referring to the citywide paving list. And so, as usual, for daring to shine a light on City operations, whether it's for bearing in mind paper streets or leading the charge for technological advancement, Bill Peduto gets branded as a big meanie. April 11: West End leaders fall in. Notable that Ravenstahl's Director of Public Works (DPW) would feel comfortable endorsing a candidate at a major campaign event. 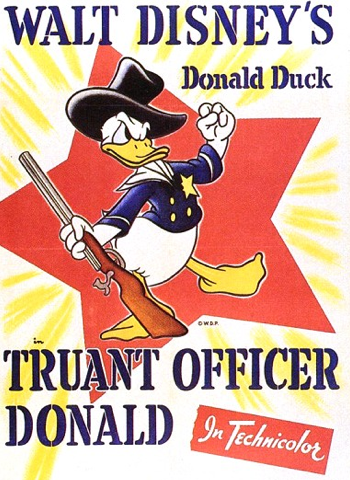 It's his privilege, but in his important service position it strikes an odd chord. Kaczorowski is objectively no stranger to politics, as the Chairman of the City's 28th Ward for the local Democratic Committee. Kevin Quigley also is a higher-up at DPW, and chairs the 27th Ward. In the old days, it would not have been unusual to link Ward Chairs as important intermediaries in the doling out of jobs and other favors for political support, and indeed echoes of that do arise. But what we're talking about here isn't quid-pro-quo corruption. What we're talking about is a resistance to transparency that resists efforts at technological upgrades. Everything cries out for a Great Leap Forward. Not good, of course. It's a poorly kept secret, from time to time on occasion, this happens. The reporter probably knew right where to look. It is unknown whether there are controls and strategies already in place within the Department to minimize knocking off on the job, even falsifying reports. Councilman Bill Peduto said that a possible solution to prevent this type of activity is to install GPS units in every city vehicle. Wagner has made a habit of swiftly echoing a lot of Bill Peduto's more popular policy positions, but has he signed on to GPS tracking on City vehicles to improve all manner of operations? Not that I can recall yet. Insisting on making City operations that transparent, accessible and efficient might be regarded by Wagner as "divisive". Now, we could stand pat at a very long Public Works post, but let's be fair. Since this is the Comet we'll take a cursory look at the entire Old Guard typified by that first example. After all, these are the people responsible for bringing you the government you're currently getting. April 4: "Another huge boost"
The IBEW, the Carpenters, the Steamfitters. Hard workers all. 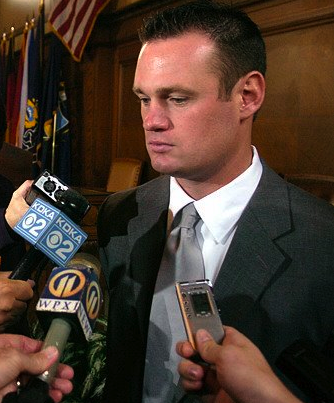 Staunch supporters of Ravenstahl's leadership 'till the end, all. Do we want them in charge of say, public transit? It took a lot more labor, public expense, and carpentry to build a tunnel under the Allegheny river than a bridge over it, and that's exactly what we got after Onorato appointed a Carpenters honcho to the Port Authority board. Do we want the building trades in charge of our wet weather strategy, as it gets negotiated in painstaking phases over time? Remember, the plan designed under this regime, professional though it was from a gray perspective, somehow totally slept on source-control "green" infrastructure. Just totally disregarded it, even resisted it. You don't suppose that's partially because "green" jobs would cut in to the amount of work these "gray" industries get to do? Hundreds of millions of dollars at stake, here. Now we're getting back to the big boys. When Wagner's candidacy suddenly became viable. We'll take the influence of the Fraternal Order of Police as read. How about the Firefighters? Never mind the hackneyed campaigning, due only to a culture insensate to privilege (but nothing Pittsburgh can't handle). How does the aggressive support of the Firefighters union bode for our chances of ending the practice of pension spiking? That raw deal is still rearing its ugly head. How about the chances of reforming our budget to take into account a "realistic" rate of pension returns? We're coming off of one good year, but professionalism clearly indicates cooling it down. How about Wagner's chances at pursuing safe, cost-saving efficiencies in the Fire Bureau? If history is any indication, not very good. And last but not least, we get to contemplate the roadblocks to rational, equitable progress suggested by the all-important presence of State Senator Jim Ferlo, D-URA. Jack Wagner has long been an aggressive advocate on behalf of the Buncher Company's and the URA's plans in what we're now calling "Riverfront Landing," or what is really the Strip District -- and we're talking back in 1989. Concerns about preserving the Strip's character was "sabotaging" jobs, he said back then, causing a furor. He wanted to fast-track it, never mind the uncertainty. 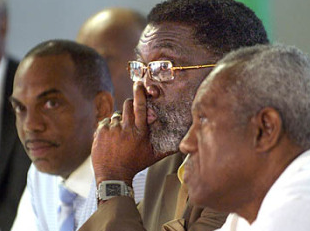 24 years later, and the special changes the plan requires still have significant popularity problems, stemming from a lack of meaningful negotiation and participation. And surely you remember Maglev. A terribly expensive, unnecessarily burdensome technology for public transportation that gobbled public money for decades to no effect. Ferlo and Wagner both were staunch supporters through the years. Wagner was particularly well-allied to one of that company's officials. Still is. But is that the kind of impractical, unrealistic, easily-impressed thinking we want polluting our very largest investments and our most crucial decisions? Taken as a whole, does the Wagner coalition, that is the Wagner and Ravenstahl coalition, seem likely to break character and deliver fundamental progress? 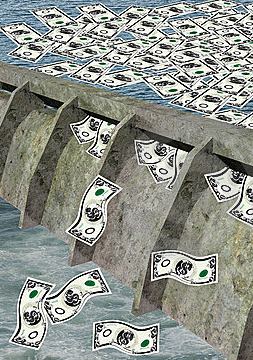 Or does it seem likely to keep us running on the hamster wheel, debating whether to finally computerize the Department of Public Works every year? The Comet understands that a newer, broader, more diverse coalition of people has finally risen as a necessary challenge to this ageless, exhausted status quo. It has bolder, more impertinent, more ambitious ideas, and fewer internal resistances to undertaking real upgrades and reforms. It's time to restore balance. It's time to see what it can do. Business is not booming among our African-American community, according to our most recent quarterly statistical reminder: higher than normal black unemployment for a major city, and more of that employment in lower-paying jobs and industries than usual. In what way is that? On his blog, Miller recommends lower business taxes; and more public investment in industrial development, infrastructure, education and public transit. Yet how to accomplish those objectives, when so much of it is directly dependent on an economically conservative PA state government that fancies its own resources stretched to the bursting point? I suppose we could try to be as persuasive as possible that the state should simply cut lose with its budget, but maybe we need to increase our odds. Making progress will take a lot of forward-thinking creativity on Pitsburgh's part: not just in pushing more publicly-assisted development projects down the pipeline (for we have been doing adequately, and should continue to do so) but leveraging opportunities in such a way that benefits trickle forth and multiply. Not to mention creatively working with our school district and making wise, knowing choices in regards to infrastructure investment.